It happens. You get exposed to somebody, or your kids do and then it starts. Sickness! What do you do? For the last 10 +years we have treated 99% of sickness at home, without it getting to the point of needing to go to the doctor. I love doctors and I’m so glad they’re there for emergencies or broken bones, but it sure is nice to not HAVE to visit them too often. The beautiful thing about our bodies is that they were made to fight sickness. If you give the body what it needs to fight properly, and you start right away, there’s a very good chance that you will recover faster. Granted, fighting sickness naturally starts long before the first sniffle. It’s about lifestyle choices the rest of the time. If you find that you or your kids are getting sick multiple times a year, you might need to take a look at your diet, activities, and lifestyle and evaluate what is hindering your health. Lack of sleep, stress without rest, poor diet, a diet high in sugar, lack of outside time, and lack of sunshine are things that contribute to chronic sickness. Make sure that you are giving yourself a fighting chance to stay well! Here is part of the protocol we follow in our house when someone gets sick with a cold or the flu. I am not a doctor or a medical professional. Please never take my advice over your doctor’s, I am a mom of 6 and a wife who has successfully used this protocol for many years. For stomach viruses, diarrhea or vomiting, we do some things differently, but these are the basics of what we do. Have you ever noticed that the cold and flu season coincides with the season where we typically eat more sugar? Sugar is the enemy of your immune system, especially refined sugar. It has NO PLACE in the diet of someone trying to fight off sickness! Get it out! We also cut out dairy for the time, and this goes for everyone in the household. I love raw dairy and I think it’s very good for the body. However, when your body is trying it’s hardest to fight off an illness, it can bog down the process. I have already addressed sugar in my Preventing Sickness post, but I am always so surprised how few people get, I mean REALLY get that sugar when you’re sick will keep you sick. It suppresses your immune system anywhere from 30 minutes-5 hours after consumption. If you want to get well fast, NO SUGAR. There really isn’t a nice way to say it and I know that it may be hard for you to hear, especially if you are addicted to sugar. If you do want to get better fast then you’ll make the sacrifice and I know you can do it. One of our first lines of defense is Homeopathy. I have a full kit with 60+ remedies on hand at all times. It has taken a few years and trial and error to get the hang of using these remedies. We have sought out Naturopaths for many years to help us find the right remedies and I have reference books on hand as well. While Homeopathy is very safe and has no side effects, that does not mean that you give it out like candy. Just because something is natural does not mean more is better. Every household should always have Oscillococinum or Influenzum on hand for the first signs of the flu. If taken at the start it will lessen the severity and help you recover faster. While many people can be down and out for 7 days with a similar sickness, we typically recover in 24-48 hrs. I only say this to state that these natural treatments do work, if you use them properly. Oscillococinum is a mixture of remedies for a general cold/flu use; it has worked very well for us for many years. Influenzum is re-formulated every year with the common strains of flu that year. You can also begin taking small doses of these at the start of flu season to inoculate yourself or your family. Homeopathic remedies can only be taken 15 minutes after food or drink and no food or drink should be consumed for another 15 minutes. These remedies are absorbed through the tongue, so eating, drinking or brushing your teeth will render it useless. Also, camphor cannot be used with or stored near remedies. Camphor is a main ingredient in Vick’s rubs and things like that. Check the labels of what is in the same cabinet as your remedies to make sure you keep them working well. This does take some skill and some investment so it won’t work for everyone. I’ve been seeing Homeopaths and using homeopathic remedies since I was 8 years old and it has worked great for me, but I do know that it doesn’t work for everyone. Did you know that’s actually how the phrase goes? We’ve heard “starve a cold, feed a fever” but that’s not how its really said. If you continue to load your system down with heavy foods while fighting a cold, you will eventually be dealing with a much worse sickness or fever. Your body can fight much better if all of it’s energy is not being drained by digesting, so eating lighter will help you recover faster. Broths, preferably homemade, and light whole foods are the best for your body when fighting a sickness. If you can, make a nutrient dense bone broth and keep it in the freezer at all times. When someone comes down with something, start them on the broth and omit heavy foods. If possible, give them only the broth and liquids to drink. Go as light as possible, although never deny your children nourishment, if they are really hungry and the broth or soup is not enough, please feed them. We also follow a lot of the ABC protocol, which is: Activate, Build, and Cleanse. This is a fantastic reference book if you are interested in learning how to use herbs to heal your family or keep them well. It also addresses diet and lifestyle to maintain health. This is my secret weapon. It’s delicious, and chock full of cold and flu fighting herbs. It contains Nettle leaf, Echinacea Root, Echinacea Tops, Elderberries, Eleuthero Root, and Rosehips. I am never without this at my house. I make a strong infusion in my french press with some good filtered water, and steep it for around 8 minutes. Add a little stevia, raw honey, or Manuka honey for added bacteria fighting benefits. My kids love this tea! I have seen this tea work in a matter of hours with croup and other sickness. I’ve been intending to make a tincture but never seem to get around to it and the tea works just fine. You can find it here with my affiliate partner Bulk Herb Store. I have always been pleased with the quality of their products and have been using them for over 8 years, their service is also outstanding. Get used to it, I’m going to talk about poop more than once I’m sure. There are many cases that bowel irregularity can be the cause of fevers, coughs and other respiratory problems. If you are merely addressing the symptoms of the sickness, you may never get to the root. Keeping yourself and your children regular is a good defense against sickness. Elderberry is one of the BEST herbal remedies! It has a gentle laxative effect which helps the body cleanse and heal quicker. It has been known to be effective on colds and flu, even severe influenza at the eleventh hour. Elderberry syrup is very easy to make and very affordable if you make it yourself. It can be pricey to buy online or in the store, but if you need it now, go get it. It is also known as Sambucus. I highly recommend giving this to children every day during the cold and flu season as a preventative and then on a more intensive hourly schedule when they are fighting a sickness. It is very safe and very effective;I have seen this help the body heal extremely fast (in mere hours) as well! We do some other things on a daily basis, some of which I already addressed in the preventing sickness post. The Bulk Herb Store is not only one of my favorite sources for herbs and teas, but it is a great place to learn about herbs and how to use them medicinally. I highly recommend that you peruse their site, I’m sure you will learn plenty just from their articles. I own many of the herbal books from their site and have poured over them and learned a lot. I am always learning more though. Was this helpful? 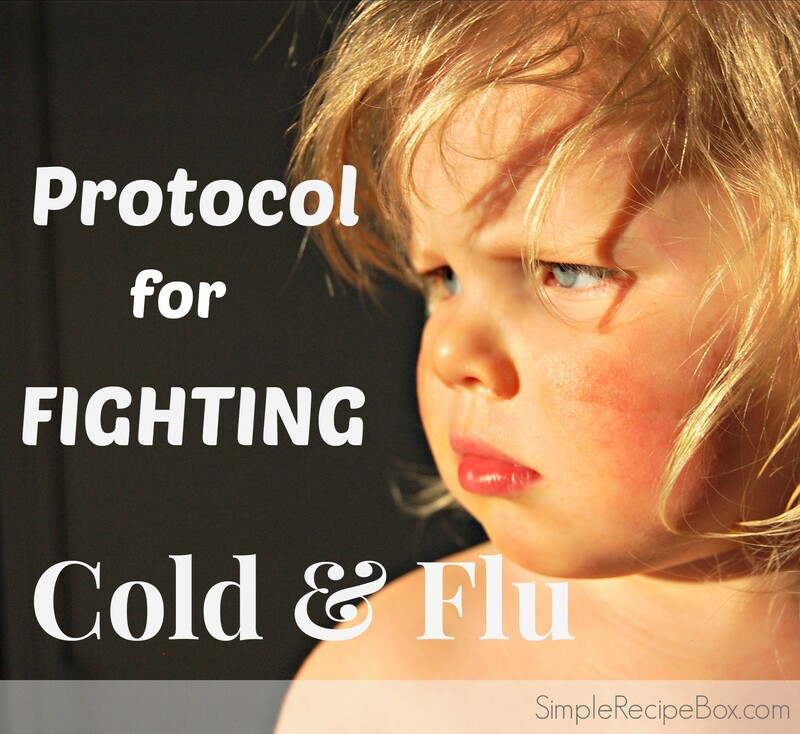 Do you have any protocols that you follow when sickness strikes? If so, leave a comment and tell us about it! The reason it looks different is because I had Red Bison Designs create my blog. They are the best out there. Here is the website: http://redbisondesign.com/projects/.